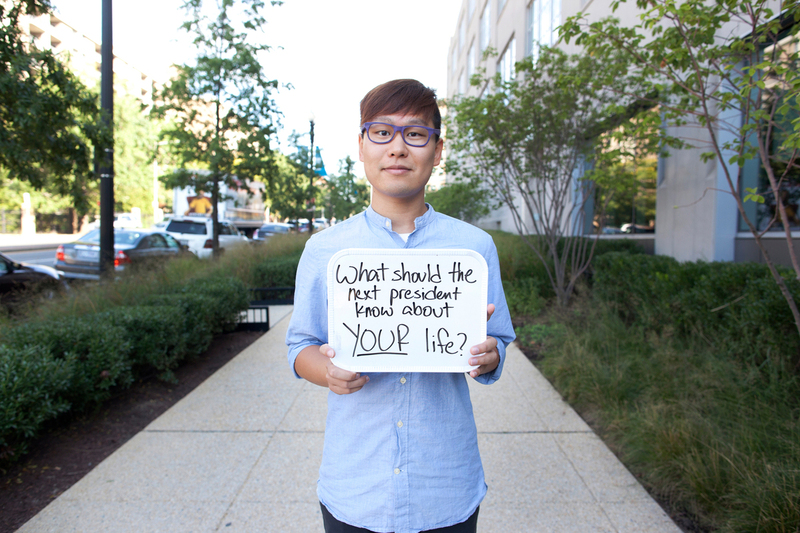 What Should Washington Know About Your Life? NPR is asking audiences to share something that they want their leaders in Washington to know about why this election matters to them. NPR's Wei Quan holds a sign prompting people to respond to the #DearWashington social media conversation about what issues the next president should know about this election season. Let's face it, this election cycle has been a bit disheartening for many voters. The candidates are the two most unpopular major party presidential candidates on record and a massive number of people won't commit to either one. Our country is facing grave challenges and serious threats — from terrorism, climate change and a growing wage gap, to name just a few — yet the campaign is also full of noise — from the latest insult to spats on Twitter. But beyond the noise, politics and — more broadly — government affect our lives, our communities and the direction of our nation. To that end, NPR is passing the mic to you, our audience. We're asking you to share something that you want your leaders in Washington to know about why this election matters to you, your families and your communities. We kicked off the conversation on Monday, Sept. 26, and some common threads have already emerged. Many of you are overwhelmed by student debt. You're worried about the well-being of your neighbors. You're paying too much for health care and child care. We've shared some of these and other stories below. Many of them have sparked their own online conversations. What else? What are your concerns this election cycle? Tell us, using #DearWashington. Share your story on Facebook, Instagram, Twitter or Snapchat. We'll be updating this page with selected stories as they keep rolling in. #DearWashington I am a disabled veteran. I am 30 years old with a newborn daughter. I have been denied medical care because I am "too young" to receive a joint replacement. I would like to be able to play with my child next year. "As a black woman, I want to feel safe"
"These are people I love"
My family includes transgender and non-heterosexual people. They are people I love. They aren't a "choice" or a "disease" or an "abomination" against Your Religion. They are people. Their right to live authentically does not harm you in any way. But your need to force Your Religion and erroneous, fear-and-ignorance based beliefs on our family hurts us. "I would love to see a country which treasures its families"
Dear future President, I am a working mom with three young children (aged 6-1/2, 4, and 3 months). I would love to see a country which treasures its families enough to offer a paid leave program. I went back to work when my youngest was only 5 weeks old, and even though I'm fortunate enough that he can come with me, it is hard! It is not just about being generally healed from physical childbirth trauma, but emotionally we need to be able to spend time with our babies, making sure they are getting the quality of care they deserve. Most babies don't sleep through the night until they are a year old, and sometimes longer than that! Parenting is hard enough...we don't need the additional challenges such as choosing between a career and a family, or family size. We live in rural America, we don't have our pick of daycares and even then some areas don't provide for jobs outside of the typical 9-5. At this point, anything is better than what we currently receive. #DearWashington: Unpaid maternity leave has to stop. I'm still catching up and struggling to pay for our kids' daycare. In the state of Ohio, I had no FMLA protection after the birth of my child because my company employs under 50 people. Not only was my maternity unpaid, I was told that I could be fired for taking a leave. That is unacceptable for 2016. The USA deserves a paid and protected maternity leave, dare I say paternity leave as well. Why do we come in behind most other countries in women's rights? #dearwashington I am terrified of how in debt I will be for taking 12 unpaid weeks of maternity leave. I am a school speech pathologist with a teacher's contract who assumed some sort of paid leave was included...nope. "Student loan debt is still crushing me"
My student loans total more than twice what I originally borrowed because of ecomonic hardship deferments. Why would the federal government want to capitalize on my hardships? Student Loan Debt continues to keep me from progressing in my life. Please offer more forgiveness programs. I am 32 years old and about $105,000 in debt for attending state college. I don't even have my degree finished yet but compounding interest + skyrocketing tuition is insane. Student loans are the worst decision I ever made in my life. I'm a 57 year old female, married 34 years to a diabetic, supporting both sets of elderly parents. Students loans are financially crushing me. Given the power of the collection practices, it feels like indentured servitude. Please help me. "I'm scared to death about climate change"
#DearWashington I'm scared to death about climate change. We need you to do your job & start working to fix the mess you've made. NOW. "I want all Americans to have the same opportunities"
#DearWashington I may not have children bc I worry about human impact on climate, what are big companies sacrificing to protect our planet? My life is very fortunate and I want all Americans to have the same opportunities as I have. "I've had to choose between food and medicine"
#DearWashington, I suffer from treatable mental health problems but can't afford the treatment. Makes me unemployable. #DearWashington: I'm trans in America. My medical procedures have been consistently denied by insurance. Every time I apply to a job, I'm outed in the background check and can be legally discriminated against. I'm a former student. I'm up to my eyeballs in debt. I live with four roommates, all with good jobs, because we can't make ends meet on our own. I've had to choose between food and medicine, but the DoE still wants their cut. I'm one of many. We need help. Step up before #thestuggle becomes a national crisis. "The quality of life in America is in decline"
We want you to know that for the first time in generations the quality of life in America is on the decline. Our wages have stagnated to the point that even though we work hard, we see little if any return. We can't afford healthcare, children, education, homes, or recreation. We can't afford the American dream! We have a system that rewards banks and corporations for stealing our future, all while it kills innocent civilians in the street. We see our friends and families sent to fight perpetual wars, all while corporations make record breaking profits selling weapons. Our elderly starve, our youth are uneducated, and our middle class is gone. This is the America we know, but it shouldn't be. It's not a question of confronting hardship for some greater good, it's a question of confronting inequality. Too few have too much, while too many have too little. We are the most productive and wealthy society in human history, yet somehow there is nothing left for those of us who make it so. Future President, we want you to know all of these things. We want you to see the world that we live in. Most of all, we want you to know that we want justice! We want you to know that we want a future! "We need a better health care system"
We need a better health care system. I have been denied spinal surgery that would significantly improve my life all because my health insurance doesn't want to pay for it. It's ridiculous. If a doctor recommends treatment, how can we be denied that treatment? It's cruel. I work in a public high school in Texas and pay the equivalent of a third of my take home pay for monthly health insurance premiums and still pay thousands out of pocket at the doctor's office and pharmacy every year. "If you really think teachers are important ..."
Dear Future President- I am a 36 year old public school teacher in Seattle. And I don't see myself EVER being able to afford a house here. Not even in the outlier parts, where I live. If you really think teachers are important, then you shouldn't be ok with the fact that they can't even live in the community they teach. We "will likely have to work until we die"
...8 years after the great recession I make almost 20k less a year. Granted I am blessed, but see no path to make up for all that was lost. That I, like many of my peers, will likely will have to work until we die. If not for the income, for the health insurance. st325xi #dearwashington, the residential facilities for folks with severe disabilities are closing at a rapid pace. "They" cite the reason as institutionalization; I have a feeling it's to do with money. But if they close, my son would end up in a psychiatric unit, which is a worse alternative. Where will these folks go? "Many of my neighbors are undocumented"
I was the only child of a sudden widow. My Dad's social security benefits helped keep a roof over our head and food on the table. Got into college through a federal program for economically and academically disadvantaged youth. Earned a master's degree. I've never been on unemployment or welfare. I am the poster child for the long-term benefits of progressive social programs. If anything, we need more programs like those from which I benefited, especially now. My school "doesn't offer health insurance..."
#DearWashington I'm a public school teacher whose school doesn't offer health insurance, regardless of full time or not.